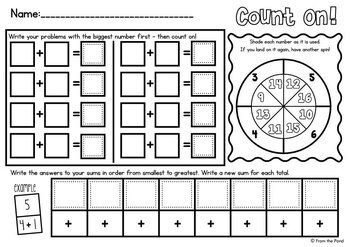 These 24 fun and engaging worksheets will help your students practice simple addition and subtractions with numbers up to thirty. 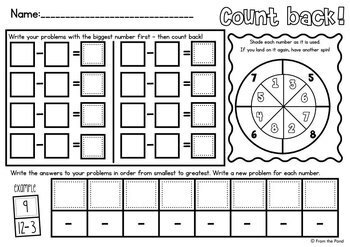 Each page features a double spinner and spaces to record addition or subtraction problems that your students will both create and solve. Students should be encouraged to count-on or count-back to solve. The student spins directly on their worksheet using a paper clip and pencil. This activity is very simple activity to prepare for your class and is so much more than just a worksheet! Please follow us here at TpT and find more of our original 'print and play' games and worksheets throughout our store categories. Find more fun games, centers, printables, worksheets and crafts for ADDITION in my TpT store HERE!